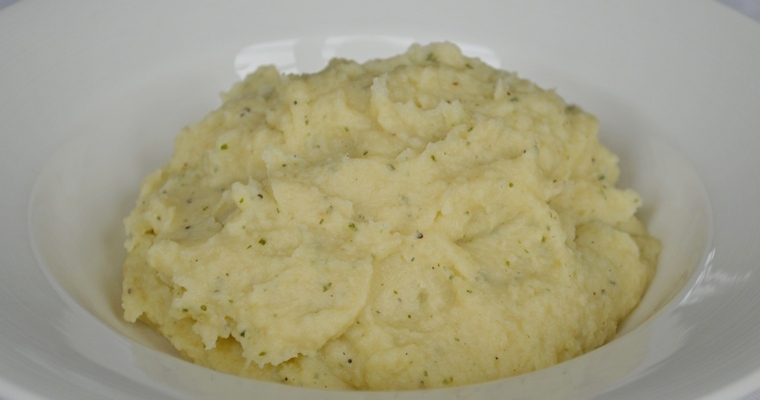 A subtle and creamy mash made from a simple blend of celeriac, parsnip and stock. This Dairy-free recipe offers an interesting alternative to potato mash. The silky smooth texture and pleasing blandness of mashed potato offers an unobtrusive backdrop for bolder flavours, making it the favourite accompaniment to rich stews and fatty meats like pork sausages. If you want to cut out or reduce white potatoes from your diet, celeriac makes a good alternative. It has a mild, almost nutty flavour, with hints of aniseed. Unusually for a root vegetable, it is low in starch. This means that, by itself, celeriac does not mash very well, having a coarse texture that does not hold together. Sticky starch molecules are needed to create a creamy texture and absorb seasoning, which is why my recipe includes parsnips for a super smooth puree. Put the celeriac, parsnip, garlic and salt in a large saucepan. Add just enough cold stock to cover the vegetables. Cover, bring to the boil, then reduce the heat to a simmer. Simmer until the vegetables are fork tender – about 25 minutes. Drain the vegetables, reserving the cooking liquid. Leave to steam dry for 5 minutes. Meanwhile, slip the garlic cloves out of their skins and place in the large bowl of a food processor (the easiest way to do this is to chop in half at the widest point, and then squeeze out using the back of a knife). Add the olive oil and parsley. Once the vegetables are ready, add to the food processor. Blend to a smooth puree, adding 4-6 tablespoons of the reserved stock until the desired consistency is reached. Return the rest of the stock to the fridge to reuse. Transfer the mash to a serving dish and serve hot.